Scott Hartnell has made a Cinderella run to win the Bettman Bracket and advance this far. After winning early contests against Rick Tocchet and Tim Peel, Hartnell faced a difficult path to further advance, with top seeds and bye-earners Gary Bettman and Marc Staal standing in his way. But Hartnell won with surprising margins, getting 64% of the vote against Bettman and 69% of the vote against Staal. The former Flyer and current Blue Jacket has a long history of being a pest against the Pittsburgh Penguins, and it's been enough to get him this far. Brandon Dubinsky earned the top seed in the bracket bearing his name going into the competition, and he's met expectations by winning his bracket and making the semifinals. After an Opening Round bye, Dubinsky easily beat Colin Campbell, Claude Giroux, and Pierre McGuire to win with ease. The Blue Jackets winger is well known for his dirty play and was suspended earlier in the season for cross checking Sidney Crosby in the neck, then again while he laid prone on the ice. He's one of the few players, if not the only one, that Crosby cannot hide his obvious disdain for, and that's a sentiment that Pens fans clearly share. Another bracket namesake has run the gamut as Mike Milbury has won his bracket and moved on. Despite being the top seed, Milbury certainly didn't have an easy path to move on. 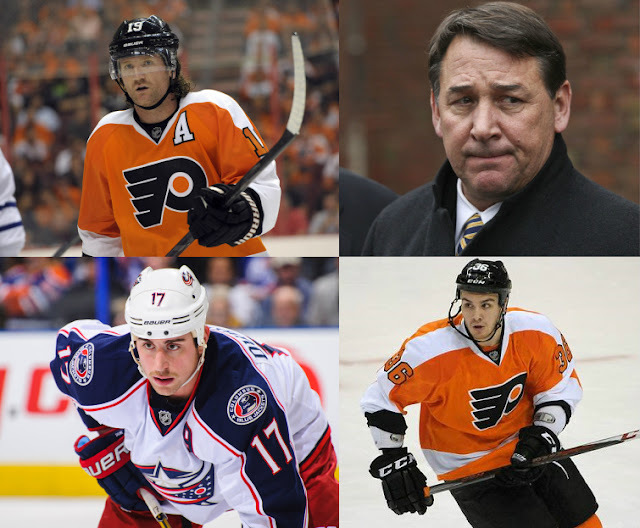 After an Opening Round bye, Milbury had to face-off against David Volek, John Tortorella, and Alexander Ovechkin to earn the right to face the other three bracket winners in the semifinals. The NBC broadcaster is infamous for his outdated and caveman-like mentality for the game, which makes sense considering Milbury once went into the stands during his playing days and beat a fan with his own shoe. Zac Rinaldo didn't earn a bye in the Scuderi Bracket, but after he mowed through the competition maybe he should have. After knocking off Petr Svoboda in the first round with 93% of the vote, Rinaldo destroyed 2nd seed Mike Johnston with 73%, killed David Morehouse with 82% of the vote, and finally had a close contest against Brad Marchand but still won 59%-41%. Zac Rinaldo is a dirty and talentless player who had been a perfect fit for the Philadelphia Flyers, but he remains a perfect fit for his new employer, the Boston Bruins. When they talk about getting rid of the players who have no business stepping onto the ice at the NHL level, Rinaldo is one of the first to come to mind. Correction: Dubinsky crosschecked Cosby as he flopped and lay prone on the ice out of anger at the disrespect shown by Crosby with such wussful play.